(ll. 1-10) Muses of Pieria who give glory through song, come hither, tell of Zeus your father and chant his praise. Through him mortal men are famed or un-famed, sung or unsung alike, as great Zeus wills. For easily he makes strong, and easily he brings the strong man low; easily he humbles the proud and raises the obscure, and easily he straightens the crooked and blasts the proud, — Zeus who thunders aloft and has his dwelling most high. Attend thou with eye and ear, and make judgements straight with righteousness. And I, Perses, would tell of true things. (ll. 11-24) So, after all, there was not one kind of Strife alone, but all over the earth there are two. As for the one, a man would praise her when he came to understand her; but the other is blameworthy: and they are wholly different in nature. For one fosters evil war and battle, being cruel: her no man loves; but perforce, through the will of the deathless gods, men pay harsh Strife her honour due. But the other is the elder daughter of dark Night, and the son of Cronos who sits above and dwells in the aether, set her in the roots of the earth: and she is far kinder to men. She stirs up even the shiftless to toil; for a man grows eager to work when he considers his neighbour, a rich man who hastens to plough and plant and put his house in good order; and neighbour vies with is neighbour as he hurries after wealth. This Strife is wholesome for men. And potter is angry with potter, and craftsman with craftsman, and beggar is jealous of beggar, and minstrel of minstrel. (ll. 25-41) Perses, lay up these things in your heart, and do not let that Strife who delights in mischief hold your heart back from work, while you peep and peer and listen to the wrangles of the court-house. Little concern has he with quarrels and courts who has not a year’s victuals laid up betimes, even that which the earth bears, Demeter’s grain. When you have got plenty of that, you can raise disputes and strive to get another’s goods. But you shall have no second chance to deal so again: nay, let us settle our dispute here with true judgement which is of Zeus and is perfect. For we had already divided our inheritance, but you seized the greater share and carried it off, greatly swelling the glory of our bribe-swallowing lords who love to judge such a cause as this. Fools! They know not how much more the half is than the whole, nor what great advantage there is in mallow and asphodel (1). (ll. 60-68) So said the father of men and gods, and laughed aloud. And he bade famous Hephaestus make haste and mix earth with water and to put in it the voice and strength of human kind, and fashion a sweet, lovely maiden-shape, like to the immortal goddesses in face; and Athene to teach her needlework and the weaving of the varied web; and golden Aphrodite to shed grace upon her head and cruel longing and cares that weary the limbs. And he charged Hermes the guide, the Slayer of Argus, to put in her a shameless mind and a deceitful nature. (ll. 69-82) So he ordered. And they obeyed the lord Zeus the son of Cronos. Forthwith the famous Lame God moulded clay in the likeness of a modest maid, as the son of Cronos purposed. And the goddess bright-eyed Athene girded and clothed her, and the divine Graces and queenly Persuasion put necklaces of gold upon her, and the rich-haired Hours crowned her head with spring flowers. And Pallas Athene bedecked her form with all manners of finery. Also the Guide, the Slayer of Argus, contrived within her lies and crafty words and a deceitful nature at the will of loud thundering Zeus, and the Herald of the gods put speech in her. And he called this woman Pandora (2), because all they who dwelt on Olympus gave each a gift, a plague to men who eat bread. (ll. 83-89) But when he had finished the sheer, hopeless snare, the Father sent glorious Argus-Slayer, the swift messenger of the gods, to take it to Epimetheus as a gift. And Epimetheus did not think on what Prometheus had said to him, bidding him never take a gift of Olympian Zeus, but to send it back for fear it might prove to be something harmful to men. But he took the gift, and afterwards, when the evil thing was already his, he understood. (ll. 90-105) For ere this the tribes of men lived on earth remote and free from ills and hard toil and heavy sickness which bring the Fates upon men; for in misery men grow old quickly. But the woman took off the great lid of the jar (3) with her hands and scattered all these and her thought caused sorrow and mischief to men. Only Hope remained there in an unbreakable home within under the rim of the great jar, and did not fly out at the door; for ere that, the lid of the jar stopped her, by the will of Aegis-holding Zeus who gathers the clouds. But the rest, countless plagues, wander amongst men; for earth is full of evils and the sea is full. Of themselves diseases come upon men continually by day and by night, bringing mischief to mortals silently; for wise Zeus took away speech from them. So is there no way to escape the will of Zeus. (ll. 106-108) Or if you will, I will sum you up another tale well and skilfully — and do you lay it up in your heart, — how the gods and mortal men sprang from one source. (ll. 121-139) But after earth had covered this generation — they are called pure spirits dwelling on the earth, and are kindly, delivering from harm, and guardians of mortal men; for they roam everywhere over the earth, clothed in mist and keep watch on judgements and cruel deeds, givers of wealth; for this royal right also they received; — then they who dwell on Olympus made a second generation which was of silver and less noble by far. It was like the golden race neither in body nor in spirit. A child was brought up at his good mother’s side an hundred years, an utter simpleton, playing childishly in his own home. But when they were full grown and were come to the full measure of their prime, they lived only a little time in sorrow because of their foolishness, for they could not keep from sinning and from wronging one another, nor would they serve the immortals, nor sacrifice on the holy altars of the blessed ones as it is right for men to do wherever they dwell. Then Zeus the son of Cronos was angry and put them away, because they would not give honour to the blessed gods who live on Olympus. (ll. 140-155) But when earth had covered this generation also — they are called blessed spirits of the underworld by men, and, though they are of second order, yet honour attends them also — Zeus the Father made a third generation of mortal men, a brazen race, sprung from ash-trees (4); and it was in no way equal to the silver age, but was terrible and strong. They loved the lamentable works of Ares and deeds of violence; they ate no bread, but were hard of heart like adamant, fearful men. Great was their strength and unconquerable the arms which grew from their shoulders on their strong limbs. Their armour was of bronze, and their houses of bronze, and of bronze were their implements: there was no black iron. These were destroyed by their own hands and passed to the dank house of chill Hades, and left no name: terrible though they were, black Death seized them, and they left the bright light of the sun. (ll. 156-169b) But when earth had covered this generation also, Zeus the son of Cronos made yet another, the fourth, upon the fruitful earth, which was nobler and more righteous, a god-like race of hero-men who are called demi-gods, the race before our own, throughout the boundless earth. Grim war and dread battle destroyed a part of them, some in the land of Cadmus at seven- gated Thebe when they fought for the flocks of Oedipus, and some, when it had brought them in ships over the great sea gulf to Troy for rich-haired Helen’s sake: there death’s end enshrouded a part of them. But to the others father Zeus the son of Cronos gave a living and an abode apart from men, and made them dwell at the ends of earth. And they live untouched by sorrow in the islands of the blessed along the shore of deep swirling Ocean, happy heroes for whom the grain-giving earth bears honey-sweet fruit flourishing thrice a year, far from the deathless gods, and Cronos rules over them (5); for the father of men and gods released him from his bonds. And these last equally have honour and glory. (ll. 169c-169d) And again far-seeing Zeus made yet another generation, the fifth, of men who are upon the bounteous earth. (ll. 170-201) Thereafter, would that I were not among the men of the fifth generation, but either had died before or been born afterwards. For now truly is a race of iron, and men never rest from labour and sorrow by day, and from perishing by night; and the gods shall lay sore trouble upon them. But, notwithstanding, even these shall have some good mingled with their evils. And Zeus will destroy this race of mortal men also when they come to have grey hair on the temples at their birth (6). The father will not agree with his children, nor the children with their father, nor guest with his host, nor comrade with comrade; nor will brother be dear to brother as aforetime. Men will dishonour their parents as they grow quickly old, and will carp at them, chiding them with bitter words, hard-hearted they, not knowing the fear of the gods. They will not repay their aged parents the cost their nurture, for might shall be their right: and one man will sack another’s city. There will be no favour for the man who keeps his oath or for the just or for the good; but rather men will praise the evil-doer and his violent dealing. Strength will be right and reverence will cease to be; and the wicked will hurt the worthy man, speaking false words against him, and will swear an oath upon them. Envy, foul-mouthed, delighting in evil, with scowling face, will go along with wretched men one and all. And then Aidos and Nemesis (7), with their sweet forms wrapped in white robes, will go from the wide-pathed earth and forsake mankind to join the company of the deathless gods: and bitter sorrows will be left for mortal men, and there will be no help against evil. (ll. 202-211) And now I will tell a fable for princes who themselves understand. Thus said the hawk to the nightingale with speckled neck, while he carried her high up among the clouds, gripped fast in his talons, and she, pierced by his crooked talons, cried pitifully. To her he spoke disdainfully: `Miserable thing, why do you cry out? One far stronger than you now holds you fast, and you must go wherever I take you, songstress as you are. And if I please I will make my meal of you, or let you go. He is a fool who tries to withstand the stronger, for he does not get the mastery and suffers pain besides his shame.’ So said the swiftly flying hawk, the long- winged bird. (ll. 212-224) But you, Perses, listen to right and do not foster violence; for violence is bad for a poor man. Even the prosperous cannot easily bear its burden, but is weighed down under it when he has fallen into delusion. The better path is to go by on the other side towards justice; for Justice beats Outrage when she comes at length to the end of the race. But only when he has suffered does the fool learn this. For Oath keeps pace with wrong judgements. There is a noise when Justice is being dragged in the way where those who devour bribes and give sentence with crooked judgements, take her. And she, wrapped in mist, follows to the city and haunts of the people, weeping, and bringing mischief to men, even to such as have driven her forth in that they did not deal straightly with her. (ll. 225-237) But they who give straight judgements to strangers and to the men of the land, and go not aside from what is just, their city flourishes, and the people prosper in it: Peace, the nurse of children, is abroad in their land, and all-seeing Zeus never decrees cruel war against them. Neither famine nor disaster ever haunt men who do true justice; but light-heartedly they tend the fields which are all their care. The earth bears them victual in plenty, and on the mountains the oak bears acorns upon the top and bees in the midst. Their woolly sheep are laden with fleeces; their women bear children like their parents. They flourish continually with good things, and do not travel on ships, for the grain-giving earth bears them fruit. (ll. 238-247) But for those who practise violence and cruel deeds far-seeing Zeus, the son of Cronos, ordains a punishment. Often even a whole city suffers for a bad man who sins and devises presumptuous deeds, and the son of Cronos lays great trouble upon the people, famine and plague together, so that the men perish away, and their women do not bear children, and their houses become few, through the contriving of Olympian Zeus. And again, at another time, the son of Cronos either destroys their wide army, or their walls, or else makes an end of their ships on the sea. (ll. 248-264) You princes, mark well this punishment you also; for the deathless gods are near among men and mark all those who oppress their fellows with crooked judgements, and reck not the anger of the gods. For upon the bounteous earth Zeus has thrice ten thousand spirits, watchers of mortal men, and these keep watch on judgements and deeds of wrong as they roam, clothed in mist, all over the earth. And there is virgin Justice, the daughter of Zeus, who is honoured and reverenced among the gods who dwell on Olympus, and whenever anyone hurts her with lying slander, she sits beside her father, Zeus the son of Cronos, and tells him of men’s wicked heart, until the people pay for the mad folly of their princes who, evilly minded, pervert judgement and give sentence crookedly. Keep watch against this, you princes, and make straight your judgements, you who devour bribes; put crooked judgements altogether from your thoughts. (ll. 265-266) He does mischief to himself who does mischief to another, and evil planned harms the plotter most. (ll. 267-273) The eye of Zeus, seeing all and understanding all, beholds these things too, if so he will, and fails not to mark what sort of justice is this that the city keeps within it. Now, therefore, may neither I myself be righteous among men, nor my son — for then it is a bad thing to be righteous — if indeed the unrighteous shall have the greater right. But I think that all-wise Zeus will not yet bring that to pass. (ll. 274-285) But you, Perses, lay up these things within you heart and listen now to right, ceasing altogether to think of violence. For the son of Cronos has ordained this law for men, that fishes and beasts and winged fowls should devour one another, for right is not in them; but to mankind he gave right which proves far the best. For whoever knows the right and is ready to speak it, far-seeing Zeus gives him prosperity; but whoever deliberately lies in his witness and forswears himself, and so hurts Justice and sins beyond repair, that man’s generation is left obscure thereafter. But the generation of the man who swears truly is better thenceforward. (ll. 286-292) To you, foolish Perses, I will speak good sense. Badness can be got easily and in shoals: the road to her is smooth, and she lives very near us. But between us and Goodness the gods have placed the sweat of our brows: long and steep is the path that leads to her, and it is rough at the first; but when a man has reached the top, then is she easy to reach, though before that she was hard. (ll. 293-319) That man is altogether best who considers all things himself and marks what will be better afterwards and at the end; and he, again, is good who listens to a good adviser; but whoever neither thinks for himself nor keeps in mind what another tells him, he is an unprofitable man. But do you at any rate, always remembering my charge, work, high-born Perses, that Hunger may hate you, and venerable Demeter richly crowned may love you and fill your barn with food; for Hunger is altogether a meet comrade for the sluggard. Both gods and men are angry with a man who lives idle, for in nature he is like the stingless drones who waste the labour of the bees, eating without working; but let it be your care to order your work properly, that in the right season your barns may be full of victual. Through work men grow rich in flocks and substance, and working they are much better loved by the immortals (8). Work is no disgrace: it is idleness which is a disgrace. But if you work, the idle will soon envy you as you grow rich, for fame and renown attend on wealth. And whatever be your lot, work is best for you, if you turn your misguided mind away from other men’s property to your work and attend to your livelihood as I bid you. An evil shame is the needy man’s companion, shame which both greatly harms and prospers men: shame is with poverty, but confidence with wealth. (ll. 320-341) Wealth should not be seized: god-given wealth is much better; for it a man take great wealth violently and perforce, or if he steal it through his tongue, as often happens when gain deceives men’s sense and dishonour tramples down honour, the gods soon blot him out and make that man’s house low, and wealth attends him only for a little time. Alike with him who does wrong to a suppliant or a guest, or who goes up to his brother’s bed and commits unnatural sin in lying with his wife, or who infatuately offends against fatherless children, or who abuses his old father at the cheerless threshold of old age and attacks him with harsh words, truly Zeus himself is angry, and at the last lays on him a heavy requittal for his evil doing. But do you turn your foolish heart altogether away from these things, and, as far as you are able, sacrifice to the deathless gods purely and cleanly, and burn rich meats also, and at other times propitiate them with libations and incense, both when you go to bed and when the holy light has come back, that they may be gracious to you in heart and spirit, and so you may buy another’s holding and not another yours. (ll. 342-351) Call your friend to a feast; but leave your enemy alone; and especially call him who lives near you: for if any mischief happen in the place, neighbours come ungirt, but kinsmen stay to gird themselves (9). A bad neighbour is as great a plague as a good one is a great blessing; he who enjoys a good neighbour has a precious possession. Not even an ox would die but for a bad neighbour. Take fair measure from your neighbour and pay him back fairly with the same measure, or better, if you can; so that if you are in need afterwards, you may find him sure. (ll. 352-369) Do not get base gain: base gain is as bad as ruin. Be friends with the friendly, and visit him who visits you. Give to one who gives, but do not give to one who does not give. A man gives to the free-handed, but no one gives to the close- fisted. Give is a good girl, but Take is bad and she brings death. For the man who gives willingly, even though he gives a great thing, rejoices in his gift and is glad in heart; but whoever gives way to shamelessness and takes something himself, even though it be a small thing, it freezes his heart. He who adds to what he has, will keep off bright-eyed hunger; for it you add only a little to a little and do this often, soon that little will become great. What a man has by him at home does not trouble him: it is better to have your stuff at home, for whatever is abroad may mean loss. It is a good thing to draw on what you have; but it grieves your heart to need something and not to have it, and I bid you mark this. Take your fill when the cask is first opened and when it is nearly spent, but midways be sparing: it is poor saving when you come to the lees. (ll. 370-372) Let the wage promised to a friend be fixed; even with your brother smile — and get a witness; for trust and mistrust, alike ruin men. (ll. 373-375) Do not let a flaunting woman coax and cozen and deceive you: she is after your barn. The man who trusts womankind trust deceivers. (ll. 376-380) There should be an only son, to feed his father’s house, for so wealth will increase in the home; but if you leave a second son you should die old. Yet Zeus can easily give great wealth to a greater number. More hands mean more work and more increase. (ll. 381-382) If your heart within you desires wealth, do these things and work with work upon work. (ll. 383-404) When the Pleiades, daughters of Atlas, are rising (10), begin your harvest, and your ploughing when they are going to set (11). Forty nights and days they are hidden and appear again as the year moves round, when first you sharpen your sickle. This is the law of the plains, and of those who live near the sea, and who inhabit rich country, the glens and dingles far from the tossing sea, — strip to sow and strip to plough and strip to reap, if you wish to get in all Demeter’s fruits in due season, and that each kind may grow in its season. Else, afterwards, you may chance to be in want, and go begging to other men’s houses, but without avail; as you have already come to me. But I will give you no more nor give you further measure. Foolish Perses! Work the work which the gods ordained for men, lest in bitter anguish of spirit you with your wife and children seek your livelihood amongst your neighbours, and they do not heed you. Two or three times, may be, you will succeed, but if you trouble them further, it will not avail you, and all your talk will be in vain, and your word-play unprofitable. Nay, I bid you find a way to pay your debts and avoid hunger. (ll. 405-413) First of all, get a house, and a woman and an ox for the plough — a slave woman and not a wife, to follow the oxen as well — and make everything ready at home, so that you may not have to ask of another, and he refuses you, and so, because you are in lack, the season pass by and your work come to nothing. Do not put your work off till to-morrow and the day after; for a sluggish worker does not fill his barn, nor one who puts off his work: industry makes work go well, but a man who putts off work is always at hand-grips with ruin. (ll. 414-447) When the piercing power and sultry heat of the sun abate, and almighty Zeus sends the autumn rains (12), and men’s flesh comes to feel far easier, — for then the star Sirius passes over the heads of men, who are born to misery, only a little while by day and takes greater share of night, — then, when it showers its leaves to the ground and stops sprouting, the wood you cut with your axe is least liable to worm. Then remember to hew your timber: it is the season for that work. Cut a mortar (13) three feet wide and a pestle three cubits long, and an axle of seven feet, for it will do very well so; but if you make it eight feet long, you can cut a beetle (14) from it as well. Cut a felloe three spans across for a waggon of ten palms’ width. Hew also many bent timbers, and bring home a plough-tree when you have found it, and look out on the mountain or in the field for one of holm-oak; for this is the strongest for oxen to plough with when one of Athena’s handmen has fixed in the share-beam and fastened it to the pole with dowels. Get two ploughs ready work on them at home, one all of a piece, and the other jointed. It is far better to do this, for if you should break one of them, you can put the oxen to the other. Poles of laurel or elm are most free from worms, and a share-beam of oak and a plough-tree of holm-oak. Get two oxen, bulls of nine years; for their strength is unspent and they are in the prime of their age: they are best for work. They will not fight in the furrow and break the plough and then leave the work undone. Let a brisk fellow of forty years follow them, with a loaf of four quarters (15) and eight slices (16) for his dinner, one who will attend to his work and drive a straight furrow and is past the age for gaping after his fellows, but will keep his mind on his work. No younger man will be better than he at scattering the seed and avoiding double-sowing; for a man less staid gets disturbed, hankering after his fellows. (ll. 448-457) Mark, when you hear the voice of the crane (17) who cries year by year from the clouds above, for she give the signal for ploughing and shows the season of rainy winter; but she vexes the heart of the man who has no oxen. Then is the time to feed up your horned oxen in the byre; for it is easy to say: `Give me a yoke of oxen and a waggon,’ and it is easy to refuse: `I have work for my oxen.’ The man who is rich in fancy thinks his waggon as good as built already — the fool! He does not know that there are a hundred timbers to a waggon. Take care to lay these up beforehand at home. (ll. 458-464) So soon as the time for ploughing is proclaimed to men, then make haste, you and your slaves alike, in wet and in dry, to plough in the season for ploughing, and bestir yourself early in the morning so that your fields may be full. Plough in the spring; but fallow broken up in the summer will not belie your hopes. Sow fallow land when the soil is still getting light: fallow land is a defender from harm and a soother of children. (ll. 465-478) Pray to Zeus of the Earth and to pure Demeter to make Demeter’s holy grain sound and heavy, when first you begin ploughing, when you hold in your hand the end of the plough-tail and bring down your stick on the backs of the oxen as they draw on the pole-bar by the yoke-straps. Let a slave follow a little behind with a mattock and make trouble for the birds by hiding the seed; for good management is the best for mortal men as bad management is the worst. In this way your corn-ears will bow to the ground with fullness if the Olympian himself gives a good result at the last, and you will sweep the cobwebs from your bins and you will be glad, I ween, as you take of your garnered substance. And so you will have plenty till you come to grey (18) springtime, and will not look wistfully to others, but another shall be in need of your help. (ll. 479-492) But if you plough the good ground at the solstice (19), you will reap sitting, grasping a thin crop in your hand, binding the sheaves awry, dust-covered, not glad at all; so you will bring all home in a basket and not many will admire you. Yet the will of Zeus who holds the aegis is different at different times; and it is hard for mortal men to tell it; for if you should plough late, you may find this remedy — when the cuckoo first calls (20) in the leaves of the oak and makes men glad all over the boundless earth, if Zeus should send rain on the third day and not cease until it rises neither above an ox’s hoof nor falls short of it, then the late-plougher will vie with the early. Keep all this well in mind, and fail not to mark grey spring as it comes and the season of rain. (ll 493-501) Pass by the smithy and its crowded lounge in winter time when the cold keeps men from field work, — for then an industrious man can greatly prosper his house — lest bitter winter catch you helpless and poor and you chafe a swollen foot with a shrunk hand. The idle man who waits on empty hope, lacking a livelihood, lays to heart mischief-making; it is not an wholesome hope that accompanies a need man who lolls at ease while he has no sure livelihood. (ll. 504-535) Avoid the month Lenaeon (21), wretched days, all of them fit to skin an ox, and the frosts which are cruel when Boreas blows over the earth. He blows across horse-breeding Thrace upon the wide sea and stirs it up, while earth and the forest howl. On many a high-leafed oak and thick pine he falls and brings them to the bounteous earth in mountain glens: then all the immense wood roars and the beasts shudder and put their tails between their legs, even those whose hide is covered with fur; for with his bitter blast he blows even through them although they are shaggy-breasted. He goes even through an ox’s hide; it does not stop him. Also he blows through the goat’s fine hair. But through the fleeces of sheep, because their wool is abundant, the keen wind Boreas pierces not at all; but it makes the old man curved as a wheel. And it does not blow through the tender maiden who stays indoors with her dear mother, unlearned as yet in the works of golden Aphrodite, and who washes her soft body and anoints herself with oil and lies down in an inner room within the house, on a winter’s day when the Boneless One (22) gnaws his foot in his fireless house and wretched home; for the sun shows him no pastures to make for, but goes to and fro over the land and city of dusky men (23), and shines more sluggishly upon the whole race of the Hellenes. Then the horned and unhorned denizens of the wood, with teeth chattering pitifully, flee through the copses and glades, and all, as they seek shelter, have this one care, to gain thick coverts or some hollow rock. Then, like the Three-legged One (24) whose back is broken and whose head looks down upon the ground, like him, I say, they wander to escape the white snow. (ll. 536-563) Then put on, as I bid you, a soft coat and a tunic to the feet to shield your body, — and you should weave thick woof on thin warp. In this clothe yourself so that your hair may keep still and not bristle and stand upon end all over your body. Lace on your feet close-fitting boots of the hide of a slaughtered ox, thickly lined with felt inside. And when the season of frost comes on, stitch together skins of firstling kids with ox-sinew, to put over your back and to keep off the rain. On your head above wear a shaped cap of felt to keep your ears from getting wet, for the dawn is chill when Boreas has once made his onslaught, and at dawn a fruitful mist is spread over the earth from starry heaven upon the fields of blessed men: it is drawn from the ever flowing rivers and is raised high above the earth by windstorm, and sometimes it turns to rain towards evening, and sometimes to wind when Thracian Boreas huddles the thick clouds. Finish your work and return home ahead of him, and do not let the dark cloud from heaven wrap round you and make your body clammy and soak your clothes. Avoid it; for this is the hardest month, wintry, hard for sheep and hard for men. In this season let your oxen have half their usual food, but let your man have more; for the helpful nights are long. Observe all this until the year is ended and you have nights and days of equal length, and Earth, the mother of all, bears again her various fruit. (ll. 564-570) When Zeus has finished sixty wintry days after the solstice, then the star Arcturus (25) leaves the holy stream of Ocean and first rises brilliant at dusk. After him the shrilly wailing daughter of Pandion, the swallow, appears to men when spring is just beginning. Before she comes, prune the vines, for it is best so. (ll. 571-581) But when the House-carrier (26) climbs up the plants from the earth to escape the Pleiades, then it is no longer the season for digging vineyards, but to whet your sickles and rouse up your slaves. Avoid shady seats and sleeping until dawn in the harvest season, when the sun scorches the body. Then be busy, and bring home your fruits, getting up early to make your livelihood sure. For dawn takes away a third part of your work, dawn advances a man on his journey and advances him in his work, — dawn which appears and sets many men on their road, and puts yokes on many oxen. (ll. 582-596) But when the artichoke flowers (27), and the chirping grass-hopper sits in a tree and pours down his shrill song continually from under his wings in the season of wearisome heat, then goats are plumpest and wine sweetest; women are most wanton, but men are feeblest, because Sirius parches head and knees and the skin is dry through heat. But at that time let me have a shady rock and wine of Biblis, a clot of curds and milk of drained goats with the flesh of an heifer fed in the woods, that has never calved, and of firstling kids; then also let me drink bright wine, sitting in the shade, when my heart is satisfied with food, and so, turning my head to face the fresh Zephyr, from the everflowing spring which pours down unfouled thrice pour an offering of water, but make a fourth libation of wine. (ll. 597-608) Set your slaves to winnow Demeter’s holy grain, when strong Orion (28) first appears, on a smooth threshing-floor in an airy place. Then measure it and store it in jars. And so soon as you have safely stored all your stuff indoors, I bid you put your bondman out of doors and look out for a servant-girl with no children; — for a servant with a child to nurse is troublesome. And look after the dog with jagged teeth; do not grudge him his food, or some time the Day-sleeper (29) may take your stuff. Bring in fodder and litter so as to have enough for your oxen and mules. After that, let your men rest their poor knees and unyoke your pair of oxen. (ll. 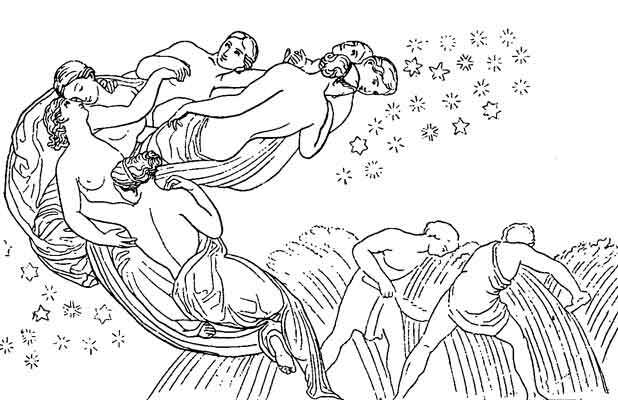 609-617) But when Orion and Sirius are come into mid-heaven, and rosy-fingered Dawn sees Arcturus (30), then cut off all the grape-clusters, Perses, and bring them home. Show them to the sun ten days and ten nights: then cover them over for five, and on the sixth day draw off into vessels the gifts of joyful Dionysus. But when the Pleiades and Hyades and strong Orion begin to set (31), then remember to plough in season: and so the completed year (32) will fitly pass beneath the earth. (ll. 618-640) But if desire for uncomfortable sea-faring seize you; when the Pleiades plunge into the misty sea (33) to escape Orion’s rude strength, then truly gales of all kinds rage. Then keep ships no longer on the sparkling sea, but bethink you to till the land as I bid you. Haul up your ship upon the land and pack it closely with stones all round to keep off the power of the winds which blow damply, and draw out the bilge-plug so that the rain of heaven may not rot it. Put away all the tackle and fittings in your house, and stow the wings of the sea-going ship neatly, and hang up the well-shaped rudder over the smoke. You yourself wait until the season for sailing is come, and then haul your swift ship down to the sea and stow a convenient cargo in it, so that you may bring home profit, even as your father and mine, foolish Perses, used to sail on shipboard because he lacked sufficient livelihood. And one day he came to this very place crossing over a great stretch of sea; he left Aeolian Cyme and fled, not from riches and substance, but from wretched poverty which Zeus lays upon men, and he settled near Helicon in a miserable hamlet, Ascra, which is bad in winter, sultry in summer, and good at no time. (ll. 641-645) But you, Perses, remember all works in their season but sailing especially. Admire a small ship, but put your freight in a large one; for the greater the lading, the greater will be your piled gain, if only the winds will keep back their harmful gales. (ll. 646-662) If ever you turn your misguided heart to trading and with to escape from debt and joyless hunger, I will show you the measures of the loud-roaring sea, though I have no skill in sea-faring nor in ships; for never yet have I sailed by ship over the wide sea, but only to Euboea from Aulis where the Achaeans once stayed through much storm when they had gathered a great host from divine Hellas for Troy, the land of fair women. Then I crossed over to Chalcis, to the games of wise Amphidamas where the sons of the great-hearted hero proclaimed and appointed prizes. And there I boast that I gained the victory with a song and carried off an handled tripod which I dedicated to the Muses of Helicon, in the place where they first set me in the way of clear song. Such is all my experience of many-pegged ships; nevertheless I will tell you the will of Zeus who holds the aegis; for the Muses have taught me to sing in marvellous song. (ll. 663-677) Fifty days after the solstice (34), when the season of wearisome heat is come to an end, is the right time for me to go sailing. Then you will not wreck your ship, nor will the sea destroy the sailors, unless Poseidon the Earth-Shaker be set upon it, or Zeus, the king of the deathless gods, wish to slay them; for the issues of good and evil alike are with them. At that time the winds are steady, and the sea is harmless. Then trust in the winds without care, and haul your swift ship down to the sea and put all the freight no board; but make all haste you can to return home again and do not wait till the time of the new wine and autumn rain and oncoming storms with the fierce gales of Notus who accompanies the heavy autumn rain of Zeus and stirs up the sea and makes the deep dangerous. (ll. 678-694) Another time for men to go sailing is in spring when a man first sees leaves on the topmost shoot of a fig-tree as large as the foot-print that a cow makes; then the sea is passable, and this is the spring sailing time. For my part I do not praise it, for my heart does not like it. Such a sailing is snatched, and you will hardly avoid mischief. Yet in their ignorance men do even this, for wealth means life to poor mortals; but it is fearful to die among the waves. But I bid you consider all these things in your heart as I say. Do not put all your goods in hallow ships; leave the greater part behind, and put the lesser part on board; for it is a bad business to meet with disaster among the waves of the sea, as it is bad if you put too great a load on your waggon and break the axle, and your goods are spoiled. Observe due measure: and proportion is best in all things. (ll. 695-705) Bring home a wife to your house when you are of the right age, while you are not far short of thirty years nor much above; this is the right age for marriage. Let your wife have been grown up four years, and marry her in the fifth. Marry a maiden, so that you can teach her careful ways, and especially marry one who lives near you, but look well about you and see that your marriage will not be a joke to your neighbours. For a man wins nothing better than a good wife, and, again, nothing worse than a bad one, a greedy soul who roasts her man without fire, strong though he may be, and brings him to a raw (35) old age. (ll. 706-714) Be careful to avoid the anger of the deathless gods. Do not make a friend equal to a brother; but if you do, do not wrong him first, and do not lie to please the tongue. But if he wrongs you first, offending either in word or in deed, remember to repay him double; but if he ask you to be his friend again and be ready to give you satisfaction, welcome him. He is a worthless man who makes now one and now another his friend; but as for you, do not let your face put your heart to shame (36). (ll. 715-716) Do not get a name either as lavish or as churlish; as a friend of rogues or as a slanderer of good men. (ll. 717-721) Never dare to taunt a man with deadly poverty which eats out the heart; it is sent by the deathless gods. The best treasure a man can have is a sparing tongue, and the greatest pleasure, one that moves orderly; for if you speak evil, you yourself will soon be worse spoken of. (ll. 722-723) Do not be boorish at a common feast where there are many guests; the pleasure is greatest and the expense is least (37). (ll. 724-726) Never pour a libation of sparkling wine to Zeus after dawn with unwashen hands, nor to others of the deathless gods; else they do not hear your prayers but spit them back. (ll. 727-732) Do not stand upright facing the sun when you make water, but remember to do this when he has set towards his rising. And do not make water as you go, whether on the road or off the road, and do not uncover yourself: the nights belong to the blessed gods. A scrupulous man who has a wise heart sits down or goes to the wall of an enclosed court. (ll. 733-736) Do not expose yourself befouled by the fireside in your house, but avoid this. Do not beget children when you are come back from ill-omened burial, but after a festival of the gods. (ll. 737-741) Never cross the sweet-flowing water of ever-rolling rivers afoot until you have prayed, gazing into the soft flood, and washed your hands in the clear, lovely water. Whoever crosses a river with hands unwashed of wickedness, the gods are angry with him and bring trouble upon him afterwards. (ll. 742-743) At a cheerful festival of the gods do not cut the withered from the quick upon that which has five branches (38) with bright steel. (ll. 744-745) Never put the ladle upon the mixing-bowl at a wine party, for malignant ill-luck is attached to that. (ll. 746-747) When you are building a house, do not leave it rough-hewn, or a cawing crow may settle on it and croak. (ll. 748-749) Take nothing to eat or to wash with from uncharmed pots, for in them there is mischief. (ll. 750-759) Do not let a boy of twelve years sit on things which may not be moved (39), for that is bad, and makes a man unmanly; nor yet a child of twelve months, for that has the same effect. A man should not clean his body with water in which a woman has washed, for there is bitter mischief in that also for a time. When you come upon a burning sacrifice, do not make a mock of mysteries, for Heaven is angry at this also. Never make water in the mouths of rivers which flow to the sea, nor yet in springs; but be careful to avoid this. And do not ease yourself in them: it is not well to do this. (ll. 760-763) So do: and avoid the talk of men. For Talk is mischievous, light, and easily raised, but hard to bear and difficult to be rid of. Talk never wholly dies away when many people voice her: even Talk is in some ways divine. (ll. 765-767) Mark the days which come from Zeus, duly telling your slaves of them, and that the thirtieth day of the month is best for one to look over the work and to deal out supplies. (ll. 769-768) (40) For these are days which come from Zeus the all-wise, when men discern aright. (ll. 770-779) To begin with, the first, the fourth, and the seventh — on which Leto bare Apollo with the blade of gold — each is a holy day. The eighth and the ninth, two days at least of the waxing month (41), are specially good for the works of man. Also the eleventh and twelfth are both excellent, alike for shearing sheep and for reaping the kindly fruits; but the twelfth is much better than the eleventh, for on it the airy-swinging spider spins its web in full day, and then the Wise One (42), gathers her pile. On that day woman should set up her loom and get forward with her work. (ll. 780-781) Avoid the thirteenth of the waxing month for beginning to sow: yet it is the best day for setting plants. (ll. 782-789) The sixth of the mid-month is very unfavourable for plants, but is good for the birth of males, though unfavourable for a girl either to be born at all or to be married. Nor is the first sixth a fit day for a girl to be born, but a kindly for gelding kids and sheep and for fencing in a sheep-cote. It is favourable for the birth of a boy, but such will be fond of sharp speech, lies, and cunning words, and stealthy converse. (ll. 790-791) On the eighth of the month geld the boar and loud- bellowing bull, but hard-working mules on the twelfth. (ll. 792-799) On the great twentieth, in full day, a wise man should be born. Such an one is very sound-witted. The tenth is favourable for a male to be born; but, for a girl, the fourth day of the mid-month. On that day tame sheep and shambling, horned oxen, and the sharp-fanged dog and hardy mules to the touch of the hand. But take care to avoid troubles which eat out the heart on the fourth of the beginning and ending of the month; it is a day very fraught with fate. (ll. 800-801) On the fourth of the month bring home your bride, but choose the omens which are best for this business. (ll. 802-804) Avoid fifth days: they are unkindly and terrible. On a fifth day, they say, the Erinyes assisted at the birth of Horcus (Oath) whom Eris (Strife) bare to trouble the forsworn. (ll. 805-809) Look about you very carefully and throw out Demeter’s holy grain upon the well-rolled (43) threshing floor on the seventh of the mid-month. Let the woodman cut beams for house building and plenty of ships’ timbers, such as are suitable for ships. On the fourth day begin to build narrow ships. (ll. 810-813) The ninth of the mid-month improves towards evening; but the first ninth of all is quite harmless for men. It is a good day on which to beget or to be born both for a male and a female: it is never an wholly evil day. (ll. 814-818) Again, few know that the twenty-seventh of the month is best for opening a wine-jar, and putting yokes on the necks of oxen and mules and swift-footed horses, and for hauling a swift ship of many thwarts down to the sparkling sea; few call it by its right name. (ll. 819-821) On the fourth day open a jar. The fourth of the mid-month is a day holy above all. And again, few men know that the fourth day after the twentieth is best while it is morning: towards evening it is less good. (ll. 822-828) These days are a great blessing to men on earth; but the rest are changeable, luckless, and bring nothing. Everyone praises a different day but few know their nature. Sometimes a day is a stepmother, sometimes a mother. That man is happy and lucky in them who knows all these things and does his work without offending the deathless gods, who discerns the omens of birds and avoids transgressions. (1) That is, the poor man’s fare, like `bread and cheese’. (3) The jar or casket contained the gifts of the gods mentioned in l.82. (5) Preserved only by Proclus, from whom some inferior MSS. have copied the verse. The four following lines occur only in Geneva Papyri No. 94. For the restoration of ll. 169b-c see “Class. Quart.” vii. 219-220. (NOTE: Mr. Evelyn-White means that the version quoted by Proclus stops at this point, then picks up at l. 170. — DBK). (6) i.e. the race will so degenerate that at the last even a new-born child will show the marks of old age. (7) Aidos, as a quality, is that feeling of reverence or shame which restrains men from wrong: Nemesis is the feeling of righteous indignation aroused especially by the sight of the wicked in undeserved prosperity (cf. “Psalms”, lxxii. 1-19). (9) i.e. neighbours come at once and without making preparations, but kinsmen by marriage (who live at a distance) have to prepare, and so are long in coming. (14) A mallet for breaking clods after ploughing. (15) The loaf is a flattish cake with two intersecting lines scored on its upper surface which divide it into four equal parts. (16) The meaning is obscure. A scholiast renders `giving eight mouthfulls’; but the elder Philostratus uses the word in contrast to `leavened’. (17) About the middle of November. (18) Spring is so described because the buds have not yet cast their iron-grey husks. (21) The latter part of January and earlier part of February. (22) i.e. the octopus or cuttle. (23) i.e. the darker-skinned people of Africa, the Egyptians or Aethiopians. (24) i.e. an old man walking with a staff (the `third leg’ — as in the riddle of the Sphinx). (26) i.e. the snail. The season is the middle of May. (31) The end of October. (32) That is, the succession of stars which make up the full year. (33) The end of October or beginning of November. (35) i.e. untimely, premature. Juvenal similarly speaks of `cruda senectus’ (caused by gluttony). (37) The `common feast’ is one to which all present subscribe. Theognis (line 495) says that one of the chief pleasures of a banquet is the general conversation. Hence the present passage means that such a feast naturally costs little, while the many present will make pleasurable conversation. (38) i.e. `do not cut your finger-nails’. (39) i.e. things which it would be sacrilege to disturb, such as tombs. (41) The month is divided into three periods, the waxing, the mid-month, and the waning, which answer to the phases of the moon. (43) Such seems to be the meaning here, though the epithet is otherwise rendered `well-rounded’. Corn was threshed by means of a sleigh with two runners having three or four rollers between them, like the modern Egyptian “nurag”.